The protests against Arizona's controversial new immigration law have centered largely around the state's sports franchises, so Arizona Gov. 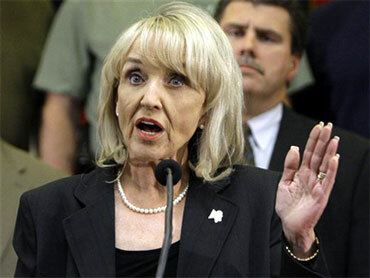 Jan Brewer has turned to ESPN.com to make the case against an economic boycott of the state. "Economic boycotts are an inappropriate and misguided response to an issue that is clearly worthy of proper public debate and discourse," Brewer wrote in an op-ed on the sports website. "Put simply, history shows that boycotts backfire and harm innocent people." The law, Brewer acknowledged, is not "the entire solution" to illegal immigration or the other problems Arizona faces due to a porous border, but it is intended to spur Washington into action after ignoring the issue for years. "Arizona is left with little choice," she wrote. "Imagine a sporting event in which rules have been agreed to for 70 years, but the umpires refuse to enforce those rules." The law in question would require immigrants in Arizona to carry documents verifying their immigration status. It would also require police officers to question a person about his or her immigration status during a "lawful stop" if there is "reasonable suspicion" that person may be in the country illegally. Opponents of the law have vehemently argued it will inevitably lead to racial profiling and have led protests across the country. Brewer said in her op-ed that "the new law undeniably prohibits law enforcement officers from considering race, color or national origin in implementing the new statute." She also highlighted that it was modified in an attempt to address some of the controversy it had created -- but the changes did not mollify critics. A handful of cities across the country, mostly on the West Coast, are moving to boycott the state of Arizona in protest of the law. Given the high number of Latino baseball players and fans, activists and sports columnists across the country are calling on Major League Baseball to pull the 2011 All-Star Game out of Phoenix. And in a nod of solidarity to Latinos protesting the law, the Phoenix Suns basketball team last night wore their "Los Suns" jerseys during Game 2 of the NBA semifinals. "Urging Major League Baseball to take away next year's All-Star Game from Phoenix is the wrong play," Brewer wrote. "Boycotts are just more politics and manipulation by out-of-state interests." In fact, one of the first proponents of an Arizona boycott was the state's own Rep. Raul Grijalva (D), who has called for a multi-pronged approach to fighting the law. The pressure of the boycott threats has already spurred some cash-strapped cities into action. Flagstaff and Tuscon on Tuesday became the first cities to sue the state over the law in part because of how damaging an economic boycott could be for their municipalities. Brewer cited Mexico's war with drug cartels as the impetus for the law. "Because of Washington's failure to secure our southern border, Arizona has become the superhighway of illegal drug and human smuggling activity," she wrote. President Obama yesterday acknowledged that Washington has failed to act and should work on comprehensive immigration reform this year. "But the answer isn't to undermine fundamental principles that define us as a nation," he said, taking a shot at the Arizona law. "We can't turn law-abiding American citizens or law abiding immigrants into subjects of suspicion and abuse."